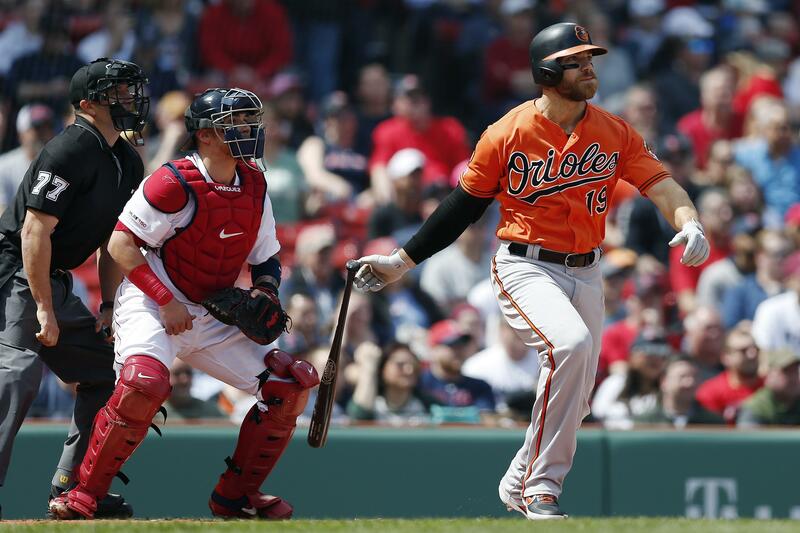 BOSTON – Chris Davis ended his record slump at 0 for 54 and drew applause from rival fans at Fenway Park, getting three hits and driving in four runs as the Baltimore Orioles beat the Boston Red Sox 9-5 on Saturday to end a four-game losing streak. SEATTLE – Jose Altuve homered for the fifth straight game, Justin Verlander (2-0) struck out eight of the first 10 batters he faced and finished with a season-high 11, and the Houston Astros won their eighth straight. Mitch Haniger hit a solo home run with one out in the fourth inning, extending Seattle’s MLB-record streak of 17 games with a home run to begin a season. Seattle has 38 homers in 17 games, but was held to a season low in runs. It was just the third time Seattle was held to less than six runs. NEW YORK – CC Sabathia began his 19th and final big league season with five stellar innings, pinch-hitter Luke Voit came through with a broken-bat RBI single in the seventh and the Yankees ended a four-game slide. Jose Rondon had Chicago’s only hit, but the second baseman also booted a likely double-play grounder to set up Voit’s hit. With the bases loaded, New York’s beefy, breakout slugger split his bat in two but still muscled a single to center against Ryan Burr for a 1-0 lead. Kyle Higashioka followed with a sacrifice fly to the warning track in right, and Tyler Wade brought in another run with a safety squeeze. Aaron Judge narrowly homered into the short right field porch in the eighth, his fourth of the season. White Sox starter Ivan Nova (0-2) dueled with Sabathia, pitching four-hit ball into the seventh. CHICAGO – Zack Cozart broke out of a slump with three hits and Cody Allen wiggled out of a jam in the ninth inning, helping Los Angeles win for the seventh time in its last eight games. MINNEAPOLIS – Michael Pineda labored through six innings, Eddie Rosario drove in two runs and the Twins edged the Detroit Tigers. Byron Buxton and Jorge Polanco added RBI singles for Minnesota. SAN FRANCISCO – Madison Bumgarner pitched into the eighth inning to give a weary bullpen much needed rest and the Giants beat Colorado to hand the Rockies their eighth straight loss. After outlasting the Rockies 3-2 in an 18-inning game that took over 5 1/2 hours and ended shortly before 1 a.m., the Giants came back about 12 hours later and wrapped up this win in 2 hours, 48 minutes. Bumgarner (1-2) allowed two runs on six hits. The big lefty struck out seven, walked one and didn’t allow a runner past first base until the sixth when Garrett Hampson doubled in Charlie Blackmon. Sam Dyson pitched the ninth for his first save. Recently acquired Kevin Pillar homered off Kyle Freeland (1-3), his fourth in six days for the Giants. Buster Posey got two hits and drove in his first run this season – the star catcher had zero RBIs in 40 at-bats over his first 12 games. TORONTO – Lourdes Gurriel Jr. hit a two-run double in the seventh inning to help the Blue Jays overcome reigning AL Cy Young winner Blake Snell’s no-hit bid in a win over Tampa Bay, snapping the Rays’ five-game winning streak. WASHINGTON – Adam Eaton and Howie Kendrick homered on consecutive pitches in the eighth inning and the Nationals rallied past the Pittsburgh Pirates. MIAMI – Newcomer Austin Dean had four hits and five RBIs, both career highs, to help the Marlins break a five-game losing streak. Dean hit his first major league homer and also drove in two runs with his first career triple to complete a 4-for-4 night. The performance came in the outfielder’s second game since being recalled from Triple-A to make his season debut with the Marlins. Miami homered three times off Zach Eflin (2-1) in the third inning, including Dean’s homer and back-to-back shots by Brian Anderson and Neil Walker. Caleb Smith (1-0) needed 29 pitches to get through the first but settled in to pitch six scoreless innings. The only hit he allowed was a double by Andrew McCutchen in the third. MONTERREY, Mexico – Derek Dietrich hit a tiebreaking homer off Adam Wainwright in the seventh inning and added a two-run triple as Cincinnati Reds won its fourth straight game, beating St. Louis in the raucous Estadio de Beisbol de Monterrey. Wainwright hit an RBI single in the second off Tanner Roark to give the Cardinals, who had won five in a row, a 1-0 lead. Jesse Winker’s one-out homer in the sixth was the Reds’ first hit off Wainwright (1-1). KANSAS CITY, Mo. – Homer Bailey (1-1) pitched seven innings of two-hit ball and the Royals won their second straight after a 10-game skid. Ian Kennedy pitched a perfect eighth and Willy Peralta followed in the ninth for his first save to complete the two-hitter. Ryan O’Hearn homered, and Whit Merrifield and Adalberto Mondesi each had an RBI single for the Royals. ATLANTA – Freddie Freeman hit a go-ahead RBI single in the second inning, Ronald Acuna Jr. had his fifth straight multihit game and the Braves snapped the New York Mets’ three-game winning streak. Touki Toussaint (1-0), recalled from Triple-A Gwinnett earlier in the day, earned the win with six strong innings of relief of starter Sean Newcomb, who last just 1 1/3 innings. Toussaint allowed four hits, one unearned run and two walks with seven strikeouts. Reliever Corey Oswalt (0-1) allowed six hits and five runs in 3 2/3 innings after replacing starter Jason Vargas, who gave up two hits, four runs and three walks in one-third of an inning. PHOENIX – Fernando Tatis Jr. hit a two-run homer and Franmil Reyes had a tiebreaking solo shot to lift San Diego to its fourth straight win. Tatis’ two-run homer, the rookie shortstop’s fourth of the season, off Merrill Kelly gave the Padres a 4-0 lead in the third inning. Reyes’ go-ahead shot in the seventh pushed the Padres to the win after Arizona tied it with four runs in the sixth. LOS ANGELES – Mike Moustakas and Orlando Arcia homered, and the Milwaukee Brewers sent the Dodgers to their sixth straight loss. The Dodgers didn’t have a hit after Alex Verdugo’s leadoff single in the fifth inning. Brewers pitchers retired the final 14 batters. Milwaukee turned three double plays behind Zach Davies (2-0), who allowed one run and eight hits in seven innings, struck out six and walked none. Junior Guerra earned his first save. Cody Bellinger hit his NL-leading ninth homer on his bobblehead night. The Dodgers’ 33 homers top the NL. Published: April 13, 2019, 11:25 p.m.